Interstate Container Cambridge ensures corrugated packaging safe for food contact. 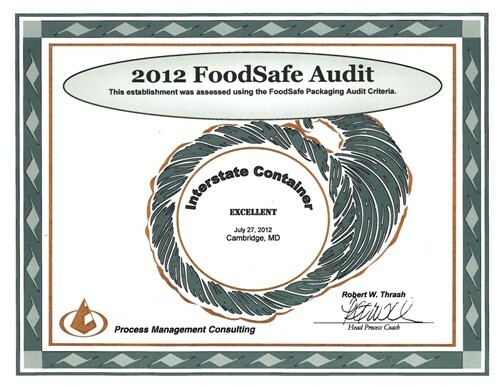 Interstate Container Cambridge scored an 88, rated as ‘Excellent’, on 2012 FoodSafe Packaging AuditÓ, conducted by Process Management Consulting on 27 July. The packaging supplier audit, which took place at Interstate Container manufacturing plant in Cambridge, MD, covered good manufacturing practices (GMP), pest control, food safety practices, food security, product traceability and recall, as well as pre-operational and operational sanitation. FoodSafe Audits evaluate food processors, food distributors, food transportation processes, and food packaging processors. Interstate Container Cambridge manufactures GREENCOAT® wax-free recyclable boxes for poultry, meat, seafood, and fresh produce packaging, as well as confectionery packaging, snack food packaging, and bakery packaging. “The excellent score achieved for this certification is another milestone attained thanks to the incredible teamwork from the Cambridge, MD members and our continuous improvement focus. Process Management Consulting offers food safety intervention and consulting services to all participants along the entire food chain, from suppliers to food processors to food transporters. Along with food safety audits, Process Management Consulting provides GFSI audits covering British Retail Consortium (BRC) and SQF criteria, as well as animal welfare audits.